When government officials and defense experts speak of the ability of the U.S. to project military power globally they usually make reference to this nation’s dominance in warfighting capabilities, such as aircraft carriers, amphibious warfare ships, strategic bombers, advanced fighters, mobile air and missile defenses or military space systems. Without question, all of these capabilities, along with forward deployed and rapidly deployable Army and Marine Corps units, are important constituent elements of a superpower military. However, it takes logistics for these U.S. fleets, systems and capabilities to go anywhere, fight anyone and stay there, for years and decades. One area where this country has a significant advantage over any putative adversary is in logistics. Over the past several decades, even as the bulk of forward deployed U.S. forces came home from their overseas bases, the military not only retained but improved its ability to conduct overseas operations, deploy and sustain joint forces worldwide. No other nation on Earth has this ability. It is particularly significant to the operations of a military that is largely continental-U.S. (CONUS)-based but tasked with multiple security responsibilities around the globe. Weaned on classical theories of nationhood, which regard linguistic unity as necessary for a country’s cohesion, Jawaharlal Nehru tried to make Hindi the national language. But being a democrat and sensitive to sectarian aspirations, he couldn’t bring himself to force India’s rich diversity into the straitjacket of a single mould. His Official Languages Act ensured English would remain paramount for a decade. Although often accused of dictatorial tendencies, his daughter shared his cosmopolitan outlook and concern for the hopes and fears of people in the South and Northeast who lacked the political clout of the Gangetic plain but were equal members of the Indian family. She amended Nehru’s Act to guarantee indefinite extension of official status for English. That remains the law of the land through which small men burdened with a task much bigger than them threaten to drive coach and horses. Ironically, it’s a minority government that wants to foist a minority language on the majority. While only 26 per cent of Indians speak Hindi, the Bharatiya Janata Party won only 31 per cent of the national vote in 2014. The injured CRPF jawans being shifted to Raipur for treatment. The Maoist attack on the 99-member Central Reserve Police Force (CRPF) party in Sukma, Chhattisgarh, in which at least 25 jawans lost their lives, has once again brought the focus on not just the threat represented by left-wing extremism (LWE) but also questions of preparation, equipping, training and strategy of the CRPF that is bearing the brunt of the burden in this fight. The fight against Maoists has been characterised by high casualty count of our security forces. The Sukma attack of April 24 was reminiscent of the ambush in Dantewada in April 2010 when Maoists killed 76 CRPF personnel and decamped with their weapons and explosives. Predictably there is anger, and there will be heavy payback for the Maoists. But it is indeed inexplicable that despite the five-decade-long insurgent movement, and a large number of paramilitary personnel along with State police being deployed in Maoism-affected areas, there seems to be no clear strategic approach to the problem and the forces do not have an upper hand in the areas. 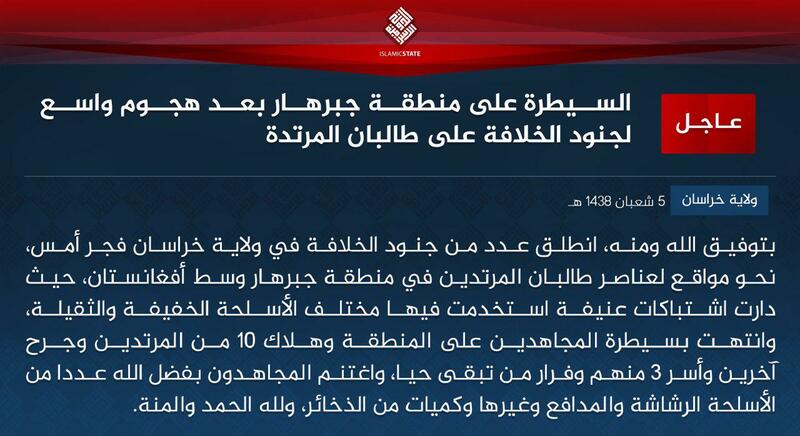 The Islamic State’s Wilayah Khorasan (or Khorasan province) claimed gains at the Taliban’s expense earlier today. The two sides clashed in the Chaparhar district of Afghanistan’s eastern Nangarhar province, where they have fought each other repeatedly during the past two years. A “number of soldiers of the caliphate in Wilayah Khorasan set out at dawn yesterday towards positions of the apostate Taliban in the area of Chaparhar,” the Islamic State claimed in a statement released via social media. Abu Bakr al Baghdadi’s followers added that they used “light and heavy” weapons during the “violent clashes,” killing 10 Taliban members and capturing three others. After allegedly forcing the Taliban’s men to flee the area, the self-declared caliphate’s “mujahidin” recovered spoils, including a “machine guns,” “cannons” and “other weapons,” as well as ammunition. Such hearings are typically closed not only to the public but also to the accused’s legal counsel, if they even have any, and to their family members. The latter is one of the chief complaints lodged against Pakistan’s military courts as family members have started publicly speaking out against the lack of information given to them over reasons for the arrest and where the accused is being held. The batteries of North Korean artillery lie just on the other side of the divided peninsula’s demilitarized zone. There are thousands of them—some hidden, others out in the open. Artillery shells are stored in an elaborate network of tunnels; and though much of the weaponry and ammunition is old, U.S. forces stationed in South Korea have no doubt they would be effective. “We are working on the next iteration of a field manual for operations, which looks at where we are and where we are going. You cannot view the current force as the only answer. Things are evolving and you do not want to wait for some perfect end state,” Smith said. While the emerging “operations” doctrine adaptation does recognize that insurgent and terrorist threats from groups of state and non-state actors will likely persist for decades into the future, the new manual will focus intently upon preparedness for a fast-developing high-tech combat environment against a major adversary. Israel’s Arrow missile defense system saw its combat debut in March 2017 when it shot down a Syrian S-200 surface-to-air missile, which was fired at Israeli fighter jets. The jets were returning home from an air strike inside Syria, reportedly targeting Syrian military positions in the country’s Homs province. This strike possibly constitutes the deepest Israeli air mission into Syrian territory so far during the civil war. “The next time the Syrians use their air defense system against our planes we will destroy them without the slightest hesitation,” Israeli Defense Minister Avigdor Lieberman declared following the incident. For its part, the Syrian regime threatened to fire Scud ballistic missiles into Israel in retaliation for future strikes. 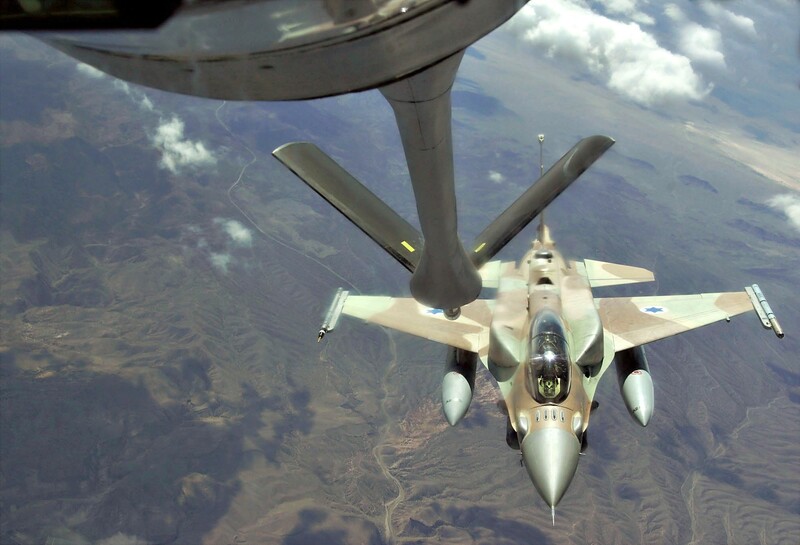 This response, a Syrian government statement added, would target Israeli military bases were Israel to attack Syrian military targets, and Israeli civilian targets in retaliation for Israeli attacks which hit Syrian civilian targets. This article argues that contrary to popular opinion, the US military strike on the Syrian Airfield does not indicate a deterioration of US-Russia relations. The Syria strike was limited to punishment for use of chemical weapons- officially supported by the Chinese foreign ministry. The key to understanding present Russia-US relations is the fact that President’s Putin approval ratings have improved markedly among Trump supporters. Despite the Syria strike, Secretary of state Tillerson and foreign minister Lavrov conducted a bilateral meeting and President Trump tweeted the same night that “Things will work out fine between the U.S.A. and Russia. At the right time everyone will come to their senses & there will be lasting peace!” While this sounds uncertain, the onset of the Trump administration has led to marked improvement in communication and meetings between US-Russia in comparison to the Obama administration. However, competition still exists in Syria, Ukraine and South Asia- specifically Afghanistan and Pakistan. It seems that by making statements of deteriorating relations that appeal to the gallery and keep their political opponents guessing, both leaders are aiming for a self-negating prophecy. This is because the Trump administration has faced scathing criticism domestically and the dismissal of ex-NSA Flynn due to secret relations with Russian officials. The United States has announced that it’s reserving the option of military force to prevent North Korea acquiring the means to deliver a nuclear warhead using a long range ballistic missile. It’s time to check our thinking about what North Korea’s counterattack response might be. Not all of the DPRK’s potential responses, nor their potential impacts, are being discussed. Current assessments of North Korea’s ability to attack the US are based on the assumption that delivery of a nuclear weapon is dependent on missile technology. But North Korea already has a system capable of delivering nuclear weapons anywhere—it’s just not rocket powered. Globalisation’s been driven in part by the development of technology. One of the most significant developments was the invention of shipping containers. Designed for peaceful and lawful purposes, they’ve been used—and continue to be used—as instruments of crime, to move narcotics, weapons, stolen property, and humans around the world. They could also be used to deliver nuclear weapons. They’re the perfect intercontinental mobile ballistic ‘missile’ system. A nuclear weapon placed inside a container could be delivered to any country and to any city, including those far from sea ports, using trains or trucks. And they cannot be destroyed by anti-ballistic missile systems being deployed by the US. On 25 November 1950, a Chinese army numbering in the hundreds of thousands unexpectedly emerged from the forbidding mountains of North Korea and crashed into the U.S. Eighth Army. Chinese soldiery, fired by revolutionary zeal and hardened by twenty years of constant conflict, flowed around U.S. units in the broken terrain like a human tide.1 U.S. forces, strung out “from hell to breakfast,” as one corps commander put it, found themselves isolated in individual companies and battered until they broke and fled south.2 In ensuing days, the U.S. 2nd Infantry Division was beaten, broken, and forced to retreat down a six-mile corridor of fire and death that earned the sobering appellation “the Gauntlet.” As U.S. forces retrograded toward Seoul, strident voices in the United States demanded to know what had happened. How had the mighty U.S. Army, that muscular organization that had crushed two aspiring world empires within the last decade, taken such a blow from a rabble of lightly armed peasant soldiers? How could an army three hundred thousand strong mass against U.S. forces and achieve complete surprise? The strategic challenges posed by resurgent global powers have largely escaped the headlines of major news publications. Most citizens do not realize that Russia and China possess the technology capable of denying US forces the ability to operate uncontested in the western Pacific Ocean or eastern Europe. Given that preserving the current rules-based international order is a key security interest of the United States, this issue poses significant problems for the US military. Fortunately, members of the defense community are formulating ways to solve this new challenge. Planners and strategists within the institutional Army are underway developing the much-publicized concept known as Multi-Domain Battle (MDB). This concept attempts to mitigate recent gains by near-peer (soon to be peer) competitors by leveraging rapid joint execution. In order to succeed, the United States must create temporary windows of superiority in a given domain of battle by using cross-domain fires, and then exploit that window to create temporary footholds with which to create further gains. Dedicated professionals remain hard at work creating new doctrine and even new task forces to optimize military efforts in line with this future warfighting concept. However, they are failing to make advances in one key area: leader development. Until the US Army develops leaders with the means, authority, and education to properly execute MDB, it will fail to adapt to an increasingly rapid pace of battle. Massive ray guns that use microwaves to instantaneously down a swarm of incoming enemy drones are approaching prime-time reality, and could propel New Mexico into a leadership role in the next wave of modern defense technology. The Air Force Research Laboratory at Kirtland Air Force Base is leading an effort to move such weapons out of the lab and into the hands of war fighters, with help from industry partners like Raytheon Missile Systems’ Ktech division in Albuquerque. Those efforts have strong backing from New Mexico’s congressional delegation, particularly from Democratic Sen. Martin Heinrich, who is spearheading a push to pump more federal spending into development programs and to encourage the Pentagon to move faster on deployment. Engility was recently awarded a $31 million task order deal from the Air Force Life Cycle Management Center, at Hanscom AFB, Mass. During her tenure as the CIA's top lawyer, Caroline Krass dealt with investigations into the CIA's enhanced interrogation programs and black sites, unrest in Ukraine and Crimea, the rise of ISIS, normalizing relations with Cuba, the Syrian refugee crisis, and Russian meddling. Now headed out the door, she says the most challenging threat the United States faces comes from cyberspace. "I think the hardest [legal questions] were those that surrounded cyber," Krass said on Tuesday at an event at Georgetown University Law School. "It's an evolving area of the law, trying to determine answers to questions like what constitutes a use of force…what are the measures to combat such a use of force?" President Donald Trump is hoping to confirm a new top lawyer for the Central Intelligence Agency this week to replace Krass, who is stepping down after three years. She'd previously worked in the Department of Justice's Office of Legal Counsel, the National Security Council, the State Department, and the Treasury. Getting the legal lay of the land correct in cyberspace is still on Washington's to-do list, even though think tanks and experts have spent years arguing about what the rules of the road for cyberspace might look like. Washington, for example, has no formal definitions for cyber warfare or any clear standards for how to retaliate for cyber attacks. The U.S. Army’s effort to create a cyber force is an inspiring example of how to affect rapid change within a bureaucracy. They have made tremendous progress in just a few years and lead the other services. The bad news is that the Army continues to struggle in the war for talent in cyberspace. The good news is that this is a fight that the Army does not need to win, or even participate in. The Army and its sister services simply have no reason to have specific cyber forces — and it may be best for the American military if they were to realize it. Even before cyber was emphasized, each of the services already had teams working on network defense operations, but that’s not a good reason to double-down on poor design. Unfortunately, a widespread lack of understanding and interservice rivalry has clouded judgment on setting up our cyber defenses, and thanks to availability bias, senior leaders see the emergence of cyber through the lens of Special Operations Command in 1987, not the creation of the U.S. Air Force in 1947. We need a professional cyber service — self-policing technical experts — but the current solution is fundamentally flawed.